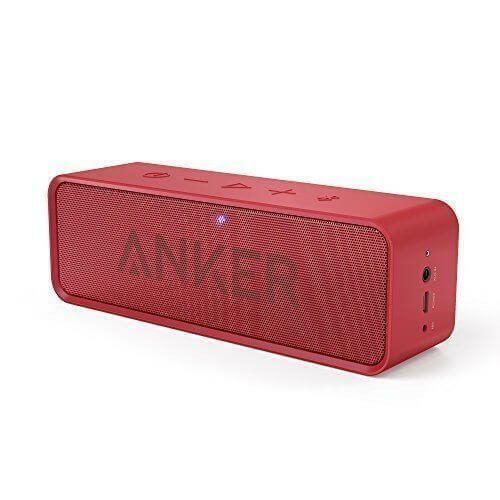 Today over at Amazon, they have a great deal on the Anker SoundCore Bluetooth Speaker. Right now you can pick one up in Black, Red or Blue for $29.99. That is a savings of $50 off the regular $79.99 price and all three colors are still in stock. The SoundCore offers you 24 hours of playtime between charges and supports Bluetooth 4.0. That means you are going to be able to get up to 66′ of range between your phone or tablet and the speaker as you stream your music. outstanding sound quality without having to spend a small fortune. Setup of the SoundCore is simple too. Just tap the Bluetooth icon on the top of the speaker to put it into search mode then find it on your phone or tablet under Bluetooth settings. Once they are paired, you can immediately start streaming your music or podcasts from your phone to the speaker. Anker backs up the SoundCore with an 18 month warranty and as one who uses Anker products today, I have no hesitation in recommending their products. They have always been of high quality and solid performance. The deal from Amazon on the Anker SoundCore is through today only and color options will be available while supplies last. At the time of this post, all colors were still in stock. No coupon code is required.